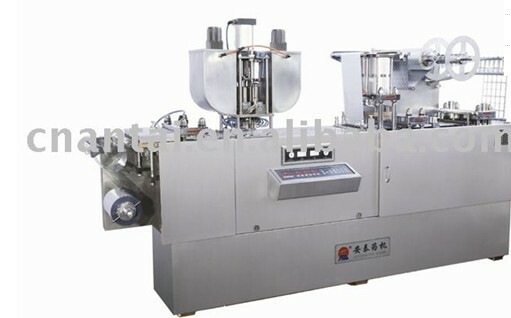 paste packing machine is suitable for packaging chocolates, biscuits, perfume, essence etc with AL/PL, Al/Al, PL/PL materials. This chocolate packaging machine is suitable for packaging chocolates, biscuits, perfume, essence, facemasks etc with AL/PL, Al/Al, PL/PL materials. It is equipped with a touch screen control system and frequency converter, with characterized by higher automation and easy operation. It is popular equipment for the foodstuff and cosmetics, particularly for those who are to make their own career. 1. The distance can be adjusted freely in the same flat surface for forming, heat-sealing, perforation, punching parts etc. It is suitable for various sizes of foodstuff packaging, and it has high precision and good Suitability. 2. Adjustable stroke, automatic feeding, register heating, positive pressure forming, up and down net web, cylinder heat-sealing, printing batch number with automatic perforation, mechanic dragging, easy operation, stable running. 3. It is adopted with imported gear reducer with lower noise and long life. 4. Correct location of die pressure plate, convenience of replacement. 6. Equipped with temperature reserve chocolate feeder, it can ensure the chocolate charged smoothly, freely and accurately. Notes: 1. It can be added register sealing device with cursor trace. Looking for ideal High Quality Chocolate Folding Packing Machine Manufacturer & supplier ? We have a wide selection at great prices to help you get creative. All the High Speed Pillow Packing Machine are quality guaranteed. We are China Origin Factory of Chocolate Packing Machine. If you have any question, please feel free to contact us.